The topsy turvy of South East Asia | Blog the world!!! 1. Let’s start, as so many travellers have to, on the Khao San Road. Ok so it’s not the ‘real’ Thailand, it’s a traveller’s hub, but it still carries that classic Thai logic. 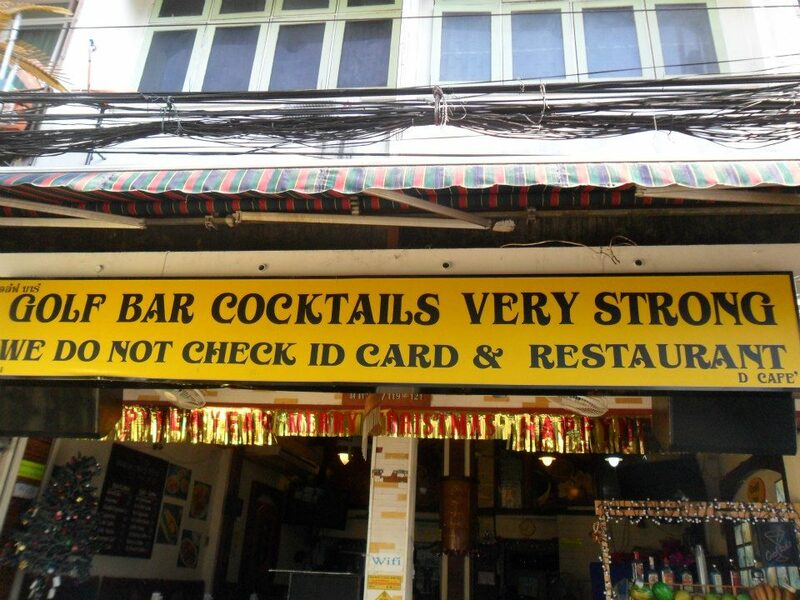 There’s a bar on that road that proudly displays a sign that reads ‘Cocktail very strong. We do not check ID card’. In front of that bar there’s a man selling fake I.Ds. That’s where he thinks the market will be at its strongest. 2. In Kep (Cambodia) 10 of us were piled into a boat to visit Rabbit Island. The guy driving the boat decided that 10 was too many and asked for two people to get out. When the two people closest to the pier started to get out he said “no” and then pointed to the two at the back of the boat furthest from the pier, “you two get out”. It clearly wasn’t anything against the two at the back. It was just an executive decision the driver made which made no sense. 3. Vietnamese shops have simply the scariest looking mannequins in the world. We saw fake children with missing limbs, eyes and fractured fake heads. Our friend Tatch assured us that these were some of the best. 4. On a (vastly overcrowded) Lymperia ferry boat from Koh Tao to the mainland someone fell from the top deck and hit into the window of the bottom deck. We’re not entirely sure what the whole story was but after that there were 2 unconscious people and a man surrounded by guards. 5. Streets in Phnom Penh are numbered for ease. Unfortunately they’re not in numerical order leaving street 111 in the south and 112 in the north. 6. Dog and cat are delicacies in Vietnam. They’re commonly eaten at weddings. But instead of breeding them for food, they’re stolen from people who keep them as pets. So that’s a common, free delicacy then. I just can’t get my head around that. 7. In Siem Reap the street children beg for food. But if you offer to buy them some from a street seller, they turn it down. They only want food from a specific supermarket. Looking back this has to have been some sort of scam, but it confused the hell out of us at the time. 8. Bangkok airport has a room specifically dedicated to ‘fish inspection’. 9. Tuk-tuk drivers in Bangkok are more expensive than taxis these days because of the commission they receive from ‘shop stops’. If you request no extra stops they’ll charge extortionate amounts because each stop pays them (one driver told us) 200THB. Because of this you hardly ever see tourists in tuk-tuks… so surely this commission idea is counterproductive?! If you’re happy with the stops though and aren’t in a hurry, tuk-tuks are practically free! Actually, why make this a top ten? I’m pretty sure a top ten list over here would only consist of nine. And therefore, in line with ’embracing the culture’, so will this one.